"...You can play as any of the twenty Premiership clubs, and unlike Premier Manager 97, Gremlin's other football title, you take control of the players yourself. Pick your team, and you get to play league, friendly or practice matches, the latter giving you the much needed chance to practice your footballing and penalty taking skills. And you'll definitely need the practice. Remember, if you lose a match, it's all down to you. Like most football games, you only control one player at once, usually the player closest to the ball, which works well for most of the game. And if you so desire you can, by pressing both buttons, cycle through the other players. You can also change your team's formation and substitute a player. It's hard to tell if the more able players perform better during match, but you can call up a screen which gives you their stats, passing, tackling and so on. The graphics are outstanding, too. Gremlin have used motion capture technology, which is basically sticking ping pong balls to people and then filming them, to make the players look more realistic. And it works - the players move smoothly and fluidly, and at an acceptable rate in SVGA mode. There are different camera angles to choose from, although I stuck with the 'far' option for the best view of the action. There's the obligatory replay option too, just so you can see yourself getting trounced. Oh, and should you feel like being a little too liberal with the fouls, you can check to see how vigilant the ref is. Though sadly, you can't bribe him to turn the other cheek while you stomp the opponent's goalkeeper. Who says violent games are bad for you? At the end of the day, it's a game of two hal.. sorry, I'll start again. At the end of the day, I can't fault Actua Soccer: Club Edition. It's fast, fun and playable, and realistic. 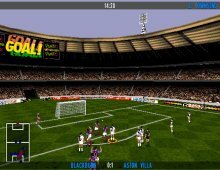 It's stuffed with stylish moves, and beats Fifa 97 in practically every department. You'll be playing for a long time before you come close to mastering the game. Get someone else round to play against, and it's even better. Even if you wouldn't dream of standing around for ninety minutes on a freezing day, this is worth a look. And if you have the slightest interest in football, you can't afford to miss this."